Purpose: To provide food to the needy. 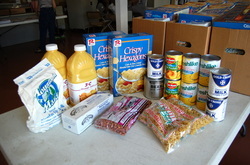 Details: Food is distributed in the church lobby each Friday from 1:00 pm to 3:30 pm to anyone who says they have a need. The need is great. We serve an average of 50 people each week. We have special bags containing food that does not require preparation to give to people who do not have cooking facilities. To Help: Volunteer to purchase food, package food or distribute food. You can place food donations in the foyer of the sanctuary. Cash donations are also needed.